- Glass Coat Photo Booth will be setting up one of their beautiful, free photo booths from 12pm-4pm. - Also, there will be two Skee Ball units in the back for people to square off against one another, courtesy of local Skee Ball champ, Joey the Cat. - At noon, we will be serving free slices of delicious Tartine cake, while the three cakes last of course, which is usually, like, five minutes. 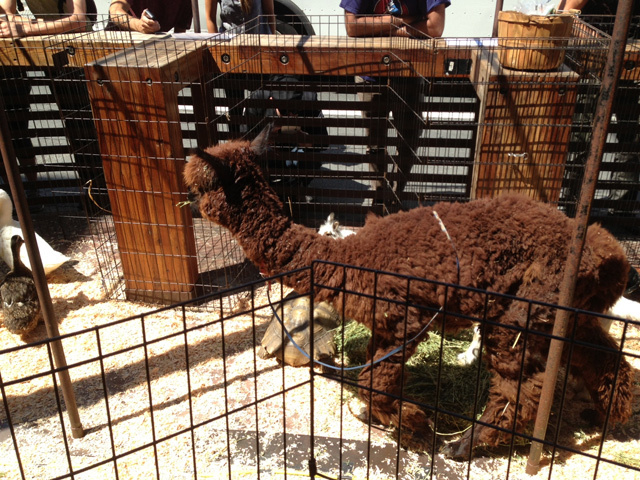 - For the kids, we’ll have a small petting zoo set up from noon to 3pm in one of our parklet corrals, courtesy of Little Explorers Mobile Petting Zoo. - For the lunchtime crowd, Los Compadres, a delicious taco truck, will be posted up outside if people want some food to go along with their lattes. It’ll be a hoot. Artisan coffee, Valencia, tacos, parklets, preciousness... makes you want to shove your head in a box ham 'n' cheese Hot Pockets and run around the Marina buzzed on Stoli, doesn't it? And if you think Four Barrel is set in their roasting ways, you can think again, chump. "We love coffee because even after all these years, coffee keeps us guessing. Things are as fresh as the day we met, and while you might think that at this point we could claim knowledge of every sock in the drawer, coffee has yet to become the predictable, housecoat wearing type," Four Barrel beams "She is still the sly seductress we’re following around the dark corner, always just a few steps behind. constantly changing, full of intrigue, disgustingly rewarding. The closest we can come to mastery is by association: we’ve mastered the art of learning about coffee." Be sure to head over the Four Barrel (375 Valencia) today to help them celebrate five years of making your morning's brighter. Update: A tipster named Keven sends us this photo, live from the scene, featuring a baby alpaca in a pen with a tortoise and a couple of ducks.